Maridi is a town in South Sudan. 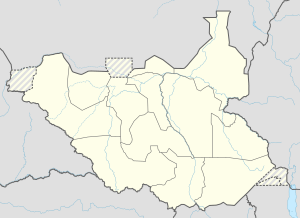 Maridi is located in Maridi County, Maridi State, near the international border between South Sudan and the Democratic Republic of the Congo. This location lies approximately 295 kilometres (183 mi), by road, west of Juba, the capital of South Sudan and the largest city in that country. The coordinates of Maridi are: 4° 54' 36.00"N, 29° 27' 0.00"E (Latitude: 4.9100; Longitude: 29.4500). Maridi has been a regional center of government since colonial times. It is also reputed to be a center of education in South Sudan.Yambio is the state capital of Western Equatoria State, which is 140 km from Maridi. Khazana Lake is a popular picnic spot and one can find NGO and UN staff enjoying the scenic beauty on a typical Sunday. The County remains lush green during the rainy season with Mango trees full of fruits. The habitat boosts of a diverse fauna, most common of them being the baboons, deer and the black mamba. In 2011, the population of Maridi was estimated at approximately 18,000. Maridi County is further divided into five Payams which have a total 17 Bomas under them. The population of the county is a mixed of many tribes prominent being, Zande, Baka, Mundu, Muro Kodo and Avokaya. The town is served by Maridi Airport. The airport sits at an elevation of 700 metres (2,300 ft), above sea level. It has a single unpaved runway, the dimensions of which are not publicly known at this time. Roads (murram base dirt roads) to and from Maridi have been reconditioned and are quite good for South Sudan. In September 2015, an oil tanker exploded on a road about 20 km from Maridi, at Bahir Naam Payam, killing over 170 people. The truck had gone off the road and overturned. People were approaching the truck in order to siphon petrol from it when it exploded. Injured were taken to Maridi Civil Hospital and Olo Primary Health Clinic in Mambe Payam, according to Radio Tamazuj. Maridi Power Sector - A locally operated electric membership company was inaugurated in 2011. The system is served by a 1.2 MW diesel generation station. Electricity is distributed at 11 kV and customers served 230/415 V, 50 Hz power, for approximately 12 hours per day. As of this edit there are approximately 600 electric meters installed on the system. Maridi water treatment plant - A water treatment plant and distribution system was inaugurated on 2010. This plant serves much of the town through water points located near roads and populated areas. ^ Nashion, Joseph (16 February 2016). "Maridi State Government Releases 40 Youth Previously Arrested In Connection To Rebellion". Gurtong. Retrieved 20 August 2016. ^ "South Sudan oil tanker blast 'kills 170' - BBC News". Retrieved 2015-09-19. ^ "Explosion of fuel tanker near Maridi kills dozens, wounds nearly 100". Radio Tamazuj. 2015-09-17. Retrieved 2015-09-19. This page was last edited on 3 December 2018, at 17:21 (UTC).